Fueled by the takeout pad thai my boyfriend picked up on his way back from work (he did not join me since he had work the next day, plus Monday's his "rest day"), I set off into the night with a couple hundred of my new best friends. Starting from the Boston Public Garden and Commonwealth Avenue, I saw a variety of bikes from fancy Pinarellos to old school Raleighs and even a couple of neon-lit elliptical bikes. A bit of background: the Midnight Marathon ride started when Greg Hum (also co-founder of Boston Bike Party/one of the greatest human beings to ever take up two wheels and a drum) and a few of his friends took the last commuter rail out to Southborough and rode the Boston Marathon route from Hopkinton all the way to the finish line at Boylston street. It grew to about 50 people in 2009. The first year I did the ride in 2013, the longest ride I had ever done prior to that was maybe about 17 miles for the Cyclofemme ride. So, doing 26.2 miles with a series of hill climbs was definitely daunting, so I took the train out, which was specifically commissioned for bike riders. Unfortunately, the year after the bombing, we were informed that not only was the MBTA not allowing bikes on the train, we were actually asked not to ride out of safety and security concerns. Yet after public outcry, concessions were made, including renting trucks for bike transport while the riders took the train, the ride went on. 2014 was also the first year I did the out and back ride with RCB (Ride Crazy Boston, who have done an out and back ride since 2013). In 2015, I was waylaid by a knee injury so I was unable to make it, but I was determined to do it again this year. 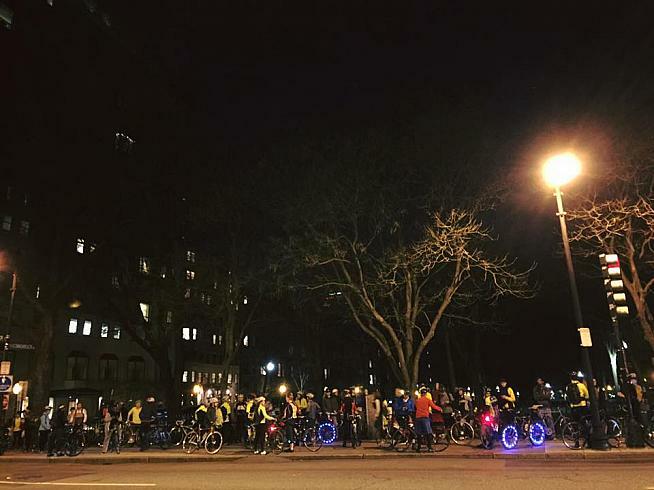 Riders light up the night congregating at the Commonwealth Avenue Mall and in front of the Boston Public Garden for the 4th annual RCB out and back ride. credit: Amy Leung. We slowly made our way out of Boston, seeming to hit every red light between the Public Garden and Kenmore. A truck swarmed by slower-moving two-wheeled vehicles decided it would be quicker to take the next turn and drive down the street over ... which happens to be Newbury Street, one of the most often double-parked, pedestrian-crossing-sans-crosswalk streets in Boston. Beacon street through Brookline seemed a bit less congested, but there was a bit of dispute about whether to continue taking Beacon or get back to Comm Ave. The map provided by RCB said to take Beacon, which in hindsight made more sense since it avoided making the world's most awkward series of turns through the train tracks at Cleveland Circle and Chestnut Hill. One person went down after their wheel taco'd in the tracks, but she and her bike appeared fine. Later on, the volunteers from the Midnight Marathon ride would help guide people perpendicularly across the even more treacherous tracks in Fitchburg and the Chestnut Hill/Cleveland Circle tracks on the way back. I rode with my friend Paolo and caught up with our friend Amy (official Midnight Marathon tweeter) around Wellesley. However, I lost them after a climb and a streetlight. Quiet solitude alternated the overarching theme of community throughout my ride that evening. I ran into my friend Jane's fiance Evan somewhere between Natick and Framingham. Around the Ashland climb, I inadvertently drafted behind a Bell Lap rider when I realized I didn't want to burn all my matches trying to pass him just to reach the halfway point of the ride. Then I ran into my friend Ari at the Hopkinton start line, who was waiting for Amy, Paolo and the others to see if they could catch dinner at their usual place before heading back. I was sad to find out later that their kitchen had closed by the time the group got there. I was still well-fueled by the sweet and peanutty rice noodles I had earlier. But just in case of risking a bonk later, I ate a surprisingly tasty packet of what amounted to baby food: applesauce with pureed peaches and sweet potato. I rode back soon after arriving at the start line, not wanting to run afoul of local authorities by lingering too long, where soon enough, another 300 of my new friends would be joining us riding from the train station at Southborough. Not to mention, what was once a balmy evening had chilled well into baselayer and kneewarmers territory. I soon found myself on a screaming descent into the dark, vaguely aware of the lights at the other side of the road making their way up the long climb to the start line, but even more aware of the red tail lights of those I'd have to either get around or grab a serious handful of brake to avoid collision. Since the roads were quiet car-traffic wise, I opted for the former, only seeming to continue picking up speed due to the lack of stop lights and signs until around Framingham, where a slowdown to cross the irregular tracks was necessary. Since much of the route was downhill on the way back, it was fun to play the game of "shadow on the road or huge night-ruining pothole?" as I tucked in and let gravity do its thing. All along the route going out and back, I saw the usual riders pulled over helping each other with flats and various other mechanicals with yet more riders calling out "you all ok?" with the answer "we're good." The Boston bike community is always friendly and helpful. Volunteers rode sweep well into the wee morning hours to make sure everyone had cleared the course safely. There was something reassuring about seeing the line of single white lights and blinking red lights lining 135 out and back, knowing that even though I was riding alone, I wasn't really. There were many riders beneath the moon and stars that night. The few cars on the road gave us wide berth in passing, waiting patiently around narrow turns before a safe straight. Occasionally a peloton would pass me. I didn't give much chase, since I had reminded myself this wasn't a race and I was just there to enjoy the evening. Besides, Wellesley was having a dance party and I got quite a few cheers and whoops as I rode past. I definitely had that in the back of my mind when I made my way up Heartbreak Hill in Newton, as I passed and was passed by others. Like during the VOMAR, I got an Aeronaut-related shoutout from a passing rider, "I didn't know Aeronaut had a cycling team!" upon seeing the back of my kit. "Hub Bicycle, Team MonsterTruck. Aeronaut is one of our sponsors." I explained between breaths, lamenting that I had not had a Saison of the Western Ghats in awhile and that it would be the perfect thing to encourage me were one waiting for me at the top of the next climb. I later found out mostly due to lack of planning and social media check-in on my part that I missed riding with my other sponsors Emily Thibodeau from Hub Bicycle and Bike Safe Boston himself, Josh Zisson by a matter of minutes since we had met up with the RCB group on opposite sides of the street earlier. Rolling back into Boston was not as slow as rolling out of it, but I still felt conscious of the street lights. 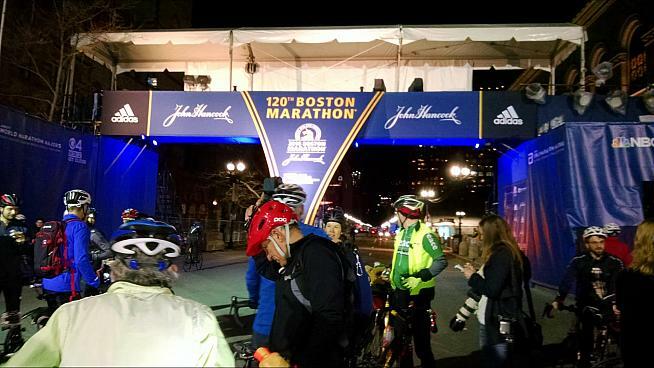 I got to the finish line just before 2:00 a.m. and watched groups take pictures in front of the finish line. Since I was a dummy and forgot to buy my tickets for the benefit pancake breakfast, I rode home alone and in silence, but still buoyed by the goodwill and cheer of the evening. The heavy police presence at the start and finish lines was a sobering reminder of past tragedy and present caution, but the spirit of the Midnight Marathon Ride reminded me that no matter what happens, we will ride and the runners will run. There is a phrase in Latin I've encountered attributed to Martial: vita Non est vivere sed valere vita est." The literal translation is "Life is not living, but being well." Or, a more poetic translation is "Life is more than being alive." There are times when I'm afraid of riding alone or in the dark, but if I lived by that self-preservation-based fear alone, I would have missed out on this most magical of nights. 53.3 miles in around 3:44 for a night jaunt isn't bad. 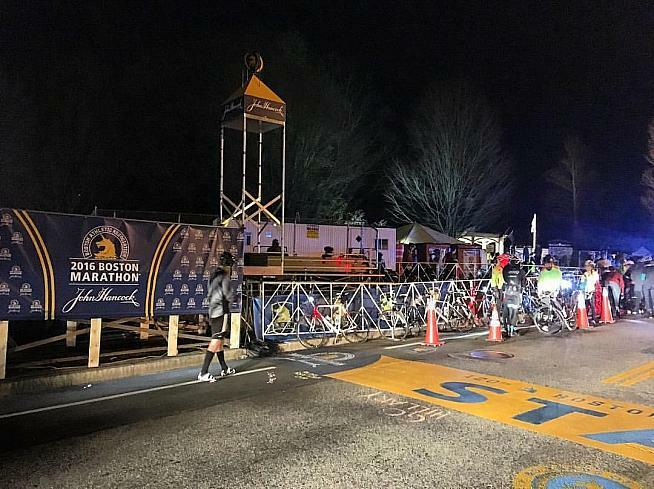 Impressively, according to Aleta Wiley, a volunteer turn guide/counter by the Newton firehouse, a total of 3,225 riders made the Midnight Marathon Ride into Boston this year, over twice the number of riders in 2015. I look forward to next year, when the starlit pennyfarthing logo of the Boston Midnight Marathon ride graces my social networking feeds once more and I get to join another few thousand of my closest friends on the road.